Traditional Italian lasagne is a well-loved dinner favourite in millions of households – you just can’t beat a good Italian ragu with creamy béchamel sauce and thin pasta sheets. Every now and then, though, we all need a bit of a change. If you’re looking for fresh inspiration for this classic dish, why not shake it up a little with some of our unusual lasagne recipe ideas? Salt, pepper and fresh basil, parsley. Place the flour on a clean work surface and make a well in the middle. Crack the eggs into the middle of the flour, and using your hands, slowly incorporate the flour into the eggs until you have a stiff dough. Add a little water if necessary to help the dough come together. Work the dough for 5-10 minutes until smooth, then leave under a tea towel to rest for 30 minutes. Chop the mortadella and mozzarella and leave them aside for now. Knead the minced meat with 1 egg, 50g the grated cheese, bread crumbs, diced parsley, the finely chopped garlic, pepper, salt, and a little milk to allow to mix better. Take a small handful of mixture and roll between your palms to create a meatball, moisten your hands with water/wine to stop the meatball sticking. Fry the meatballs in some olive oil. In another pan, fry the finely chopped onions and then add the tomato puree, a little water and basil. Transfer the meatballs and cook for a further 15 minutes. When the lasagne sheets are rested, roll into thin rectangular sheets (about 10cm x 15cm). In a rectangular baking tray pour tomato sauce on the bottom, then a layer of lasagne sheets and cover with tomato sauce, grated cheese, half of the meatballs and half of mortadella and mozzarella. A generous sprinkle of grated cheese to finish the first layer. Another of layer of pasta again and continue with the other ingredients as for the first layer. Close the second layer with pasta, covering it with tomato sauce equally and sprinkle with grated cheese. Cover the baking tray with aluminium foil and place in the oven at 200 degrees for 20 – 30 minutes. 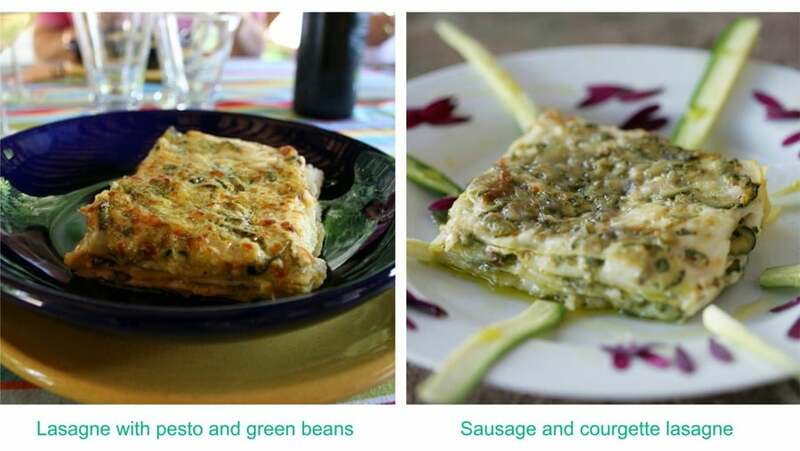 So, which of these unusual lasagne recipes would you like to see next – lasagne with pesto and green beans or sausage and courgette lasagne? Let us know in your comments below!